General oblique aerial view looking across the canal, taken from the ENE. NS98SW 57 From NS 9000 8148 to NS 9229 8244. The canal follows a fairly straight line, passing through Lock 3 (NS98SW 40), as far as Lock 2 (NS98SW 47), which is situated at the inner end of a basin (NS98SW 48). Around the basin and the harbour is wharfage and a small block of streets. Access to the basin from the harbour is obtained through Lock 1 (NBS98SW 49). The canal passes under a railway bridge (NS98SW 38), a towpath running alongside, but terminates shortly before reaching the former Lock 3 (NS98SW 40). The stretch between here and its original entry from the River Carron, a distance of one mile and 680 yards, has been infilled. A pipeline takes the water, which is fed to it across a weir. Clues as to the course of the canal can be obtained. There are two hedges between the M9 and the A905 which delineate the outer bounds of the canal. The Dalgrain Road, E of the A905, runs alongside the former line of the canal which is now followed by a new road, although there are some deviations due to the erection of buildings. At this point there is a low wall embankment, with a railing on top which formerly supported the towpath. The buildings themselves are on the site where Canal Street used to run beside the canal. Although the timber yards still exist in Grangemouth, the extensive timber basins (NS98SW 42 and NS98SW 44) have been infilled. The sites of the entrances to the basins from the docks can be identified, but the boat-yard of the Grangemouth Yacht Club masks the entrance to the canal from the River Carron. The current termination of the canal is visible from the old railway bridge (NS98SW 38), but Lock 3 (NS98SW 40) is no longer in existence. The line of the canal can be determined as a field appearing from the M9 and a wide street taking a route towards the docks. On the 1st edition of the OS 6-inch map (Stirlingshire 1856-66, sheet xxv) and the 2nd edition of the OS 6-inch map (Stirlingshire 1899, sheet xxvSW) the canal is clearly visible running approximately SW to NE towards the basin (NS98SW 48) and harbour at Grangemouth. Timber basins (NS98SW 42 and NS98SW 44) can be seen to the E of the canal just SW of the docks. A system of wet docks (NS98SW 51 and NS98SW 54) is linked to the E timber basin (NS98SW 44), with locks (NS98SW 56) giving access to the River Carron. Although the wet docks are still visible as Junction Dock and Old Dock on the current edition of the OS 1:10000 map (1993) and the OS Basic Scale digital map (2000), the canal is seen to terminate just E of the railway bridge (NS98SW 38). Information from RCAHMS (MD) 29 November 2000. The length of the Forth and Clyde Canal within the boundary of the civil parish of Falkirk is scheduled under reference number 6768. This area extends from Woodneuk, Castlecary (NS 7849 7844) to the M9 bridge at Glensburgh (NS 9093 8175), across portions of map sheets NS77NE, NS87NW, NS88SW, NS88SE and NS98SW. Information from Historic Scotland, scheduling document dated 9 July 1998. NS 905 816 A watching brief was undertaken 2 November – 7 December 2011 during the construction of an access road within the scheduled area for the Forth and Clyde Canal between Falkirk and Grangemouth. The work recorded only made ground, modern service trenches and modern artefacts. NS 90925 81759. GUARD Archaeology Limited were commissioned to undertake an archaeological watching brief during the construction works for the insertion of a drainage pipe through an in-filled section of the Forth and Clyde Canal Scheduled Monument at The Helix, Falkirk, Stirlingshire. This work was undertaken on three days between 1st August and 6th August 2013. The excavation revealed a cut made during the removal of the original stone wall, and the modern material used to in-fill this canal section. GUARD Archaeology Ltd were commissioned to undertake an archaeological watching brief during the construction works for the Helix Canal Connection to the Forth and Clyde Canal Scheduled Ancient Monument Area between Falkirk and Grangemouth. The canal wall of the Forth and Clyde Canal at this juncture was clearly identifiable during this watching brief and was found to consist of timber pilings and heavily compacted grey clay, capped by large cap stones. The foundation trench was infilled with natural boulder clay. Subsurface deposits on the south bank of the canal have also evidently been disturbed previously by service trenches. The canal connection area lies within the eastern part of the Castlecary-M9 Motorway section of the Forth and Clyde Canal, located to the north of Falkirk and centered on NGR NS 9053 8162. 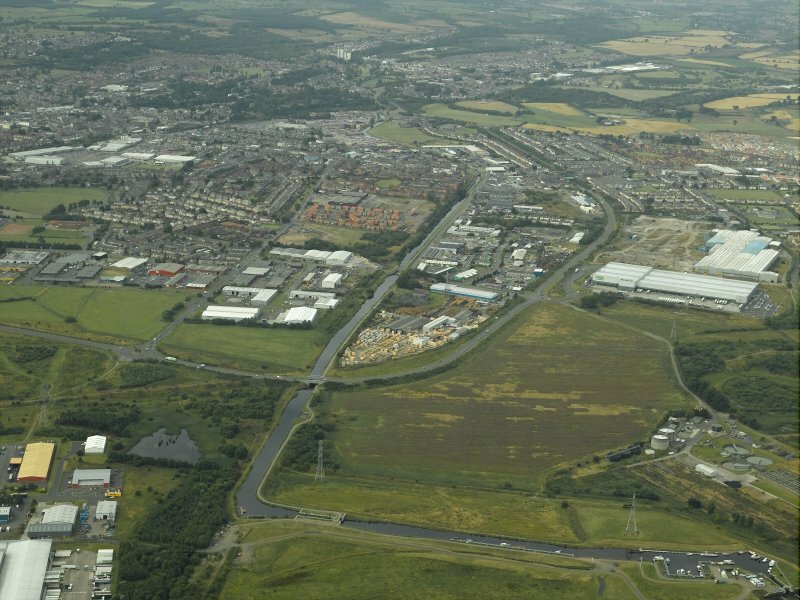 The precise area of groundworks subject to the archaeological watching brief is bounded to the north by the Forth and Clyde Canal, to the south and east by the Helix Canal access road and to the west by the A9. Six sites of archaeological interest aresituated within the immediate environs of the development area.